Nearly 5,000 square feet of 405 freeway-adjacent state-of-the-art signs. 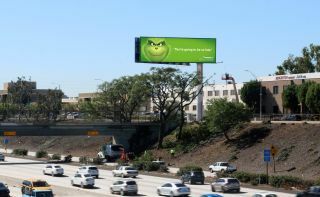 WOW Media, an LA-based digital media company offering innovative solutions for digital out of home advertising, has unveiled four new 1,200 square foot digital billboards in Los Angeles. The two-sided structures are the largest digital signs in the LA region at 20’ x 60’. Situated between the Century Blvd. and Manchester Blvd. exits along Interstate 405, consistently ranked as the nation’s busiest freeway, the signs offer premium exposure to millions of commuters and travelers using the nearby Los Angeles International Airport (LAX). These are also the only digital signs reaching freeway traffic to the highly sought-after communities of West Los Angeles including Beverly Hills and Santa Monica. These new signs join WOW Media’s existing network of eight 14 feet x 48 feet full-motion billboards, all situated on key traffic arteries adjacent to LAX. As the region’s only digital billboard network, campaigns can be synced across boards for maximum exposure and impact.